Panel discussion – CAN WE TALK ABOUT MAVO? 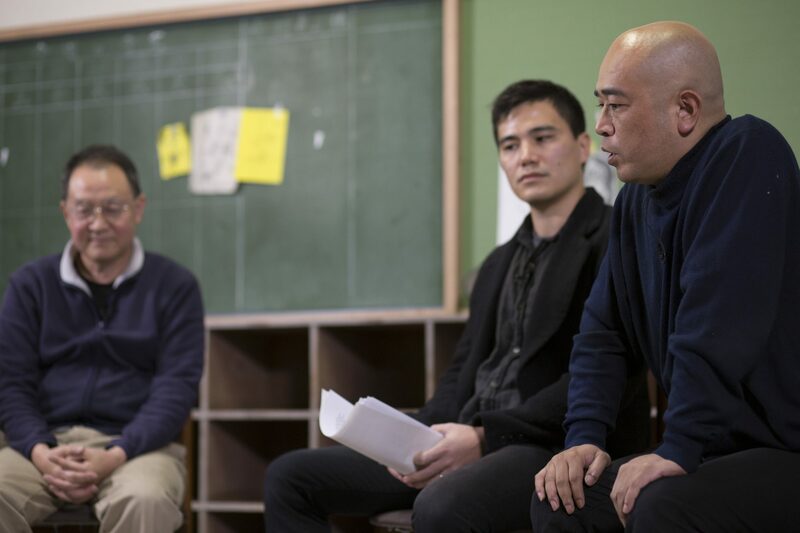 Focusing on the question of the historicization of Japanese avant-garde and art activism, the artist curated a panel discussion in the ‘library’ to talk over MAVO from different positions approaches. Panels consisted of Yoshio Shirakawa (artist, art critic), Sen Uesaki (art study/archive theorist) and Toyama Koichi (Kyushu Fascist Party, revolutionary) and the discussion was moderated by Andrew Maerkle (Deputy Editor, ART iT). The discussion was filmed by Artists’ Guild, Japanese artist collective, and Camilo Henriquez. Shirakawa Yoshio studied philosophy and art in France and Germany during the 1970s and returned to Japan in 1983. Since then, based in Gunma Prefecture, he has undertaken to embrace regional, peripheral and minor characteristics of the area actively by realizing projects such as “Location: Gunma” that is strongly connected with the regional history, culture, and economy apart from dominant contemporary art trends and discourses and a central logic of the mainstream of the art world. Moreover, Shirakawa has taken a forward-looking approach to a current art trend, emphasizing multiculturalism and social participation. Having carried out an extensive researched and written on modern and contemporary art history, he continuously criticizes and re-examines art-historical perspectives and standards that have prevailed in the mainstream of the contemporary visual arts. His works often employ everyday materials with shape and color reconfigured with a light touch and arrayed precisely. Shirakawa conveys the magic and potential of sculpture while continuing to explore its theory and practice. Uesaki is interested in “the end of art,” dragging up the obsolete anxiety of the museum. He examines non-curatorial, non-displaying, and hence archival state of art in the postmodernist period: without fructification as individual pieces the art remained as a vague middle-layer between language and material corpus. Born in 1970. Lives in Fukuoka, Japan. Koichi Toyama self-proclaimed as a “good fascist”, attempting to subvert democracy = mobocracy. In 2007, Toyama ran for Tokyo gubernatorial election as a candidate and attracted considerable attention for his speech in which he completely disapproved an electoral system. Since then, he has followed after election campaign cars by pro-nuclear groups with his propaganda truck that speaks “Let’s destroy such a country by nuclear power” with Chopin’s funeral march in every big elections in Japan among other political actions of him. Along with it, he has carried out a Fake Election Campaign that appeals for a zero vote. Through such actions, he attempts to take serious issues in a non-serious manner and vice versa. Although he persistently insists that “What I do is political activities, by no means sophomoric art”, he once claimed that “in order for art to have power, it must not declare itself art”. *Additional note: although his action is rather regarded as anarchistic. However, he insists to call himself a “good fascist”. He argues that “a-narchy” can be no longer understood and discussed as it is under a democratic system (it usually presents a state of “disorder” due to absence of authority). Consisting of four party members, Kyushu Facist Party often plays with common notions of politics and questions how they are already too established. Its social and political action is regarded as not “political” in the sense that it does not benefit from a political categorization. Andrew Maerkle is a writer, editor and researcher based in Tokyo. He is currently the Deputy Editor of the bilingual online art publication ART iT | International Edition, and a contributor to international journals including Art & Australia, Artforum and Frieze. From 2006-08 he was the Deputy Editor of ArtAsiaPacific magazine in New York.